This entry was posted in Recent Posts and tagged Attraction, Awareness, Gut reactions, Haiku, High expectation, Impression, Life, Men & Women, Not good enough, Pain, Photography, Poetry, Sorry. Bookmark the permalink. Beautiful straightforward words and such a lovely flower Audrey! Thank you so much! Often times I get lucky behind the camera. Reaction to a seminal act? I have to agree – excuses don’t forgive. 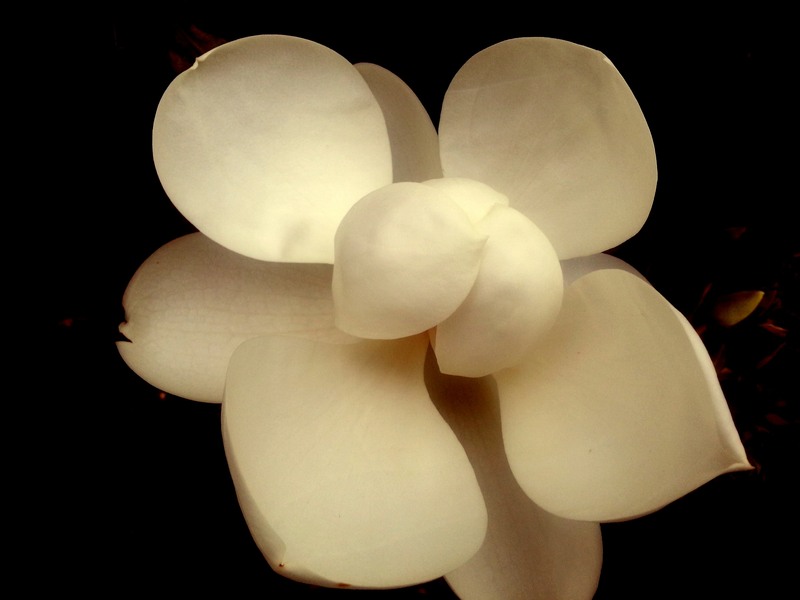 But that is one magnificent magnolia blossom. I can nearly smell it. Texas had some beautiful magnolias. I loved watching them bloom. Direct. Intense. Almost a flower’s response to any number of things that we can not acknowledge or accommodate in our minds at times. Your words regardless of their tone or mood I always find striking and comforting from so many angles. We need to talk more about that idea we’re tinkering with eh? Thank you, Duke. Mant poets tend to write what is on their heart, and I’m no different. Sometimes I allow for these sidewinders to be read. Funny how easily I can remember why the haiku was written. Anyway, thanks again, and yes we did talk about putting your music to one of my poems. I haven’t forgotten. Just not there yet. You always have the kindest words. A bit of poetry in that comment up there, you know. Very sweet. Your Canadian is showing. Smiles. Surely at some point your words will return. Either way your music keeps you creative and inspired, which is good. Yeah, okay. No apologies then. Is this a Magnolia bloom?? Whatever, it’s glorious! So’s your Haiku, even though I hear lots of wistfulness and a twinge of … what? Regret? Sadness? Tis, Debbie. 🙂 I believe there is regret and sadness, but mostly, sarcasm. I was in a mood, you know. Happens. Took this photo over a year ago. I’m glad you like it. I’d forgotten about this haiku. Thanks for reading along, my friend.